Traditional Chinese medicine is over 2,000 years old. It originated in the region of eastern Asia that today includes China, Tibet, Vietnam, Korea, and Japan. The first written Chinese medical treatises (as the West understands the term) date from the Han dynasty (206 B.C. – A.D. 220). Tribal shamans and holy men who lived as hermits in the mountains of China as early as 3500 B.C. practiced what was called the “Way of Long Life.” This regimen included a diet based on herbs and other plants; kung-fu exercises; and special breathing techniques that were thought to improve vitality and life expectancy. After the Han dynasty, the next great age of Chinese medicine was under the Tang emperors, who ruled from A.D. 608-A.D. 906. The first Tang emperor established China’s first medical school in A.D. 629. Under the Song (A.D. 960–1279) and Ming (A.D. 1368–1644) dynasties, new medical schools were established, their curricula and qualifying examinations were standardized, and the traditional herbal prescriptions were written down and collected into encyclopedias. One important difference between the development of medicine in China and in the West is the greater interest in the West in surgical procedures and techniques. In the nineteenth and early twentieth centuries, the opening of China to the West led to the establishment of Western-style medical schools in Shanghai and other large cities, and a growing rivalry between the two traditions of medicine. In 1929 a group of Chinese physicians who had studied Western medicine petitioned the government to ban traditional Chinese medicine. This move was opposed, and by 1933 the Nationalist government appointed a chief justice of the Chinese Supreme Court to systematize and promote the traditional system of medicine. In contemporary China, both traditional and Western forms of medicine are practiced alongside each other. In Taoist thought, the Tao, or universal first principle, generated a duality of opposing principles that underlie all the patterns of nature. These principles, yin and yang, are mutually dependent as well as polar opposites. They are basic concepts in traditional Chinese medicine. Yin represents everything that is cold, moist, dim, passive, slow, heavy, and moving downward or inward; while yang represents heat, dryness, brightness, activity, rapidity, lightness, and upward or outward motion. Both forces are equally necessary in nature and in human well-being, and neither force can exist without the other. The dynamic interaction of these two principles is reflected in the cycles of the seasons, the human life cycle, and other natural phenomena. One objective of traditional Chinese medicine is to keep yin and yang in harmonious balance within a person. Traditional Chinese physicians did not learn about the structures of the human body from dissection because they thought that cutting open a body insulted the person’s ancestors. Instead they built up an understanding of the location and functions of the major organs over centuries of observation, and then correlated them with the principles of yin, yang, qi, and the Five Elements. Thus wood is related to the liver (yin) and the gall bladder (yang); fire to the heart (yin) and the small intestine (yang); earth to the spleen (yin) and the stomach (yang); metal to the lungs (yin) and the large intestine (yang); and water to the kidneys (yin) and the bladder (yang). The Chinese also believed that the body contains Five Essential Substances, which include blood, spirit, vital essence (a principle of growth and development produced by the body from qi and blood); fluids (all body fluids other than blood, such as saliva, spinal fluid, sweat, etc. ); and qi. A unique feature of traditional Chinese medicine is the meridian system. Chinese doctors viewed the body as regulated by a network of energy pathways called meridians that link and balance the various organs. The meridians have four functions: to connect the internal organs with the exterior of the body, and connect the person to the environment and the universe; to harmonize the yin and yang principles within the body’s organs and Five Substances; to distribute qi within the body; and to protect the body against external imbalances related to weather (wind, summer heat, dampness, dryness, cold, and fire). It is holistic; all aspects of the person’s being are taken into account. It treats the root cause of the disease as well as the manifest symptoms. Chinese practitioners distinguish between the root (ben) of an illness and its branches (biao). The root is the basic pattern of imbalance in the patient’s qi; the branches are the evident symptoms. It improves a person’s general health as well as treating specific diseases or disorders. Acupuncture is probably the form of treatment most familiar to Westerners. It is often used for pain relief, but has wider applications in traditional Chinese practice. It is based on a view of the meridians that regards them as conduits or pathways for the qi, or life energy. Disease is attributed to a blockage of the meridians; thus acupuncture can be used to treat disorders of the internal organs as well as muscular and skin problems. The insertion of needles at specific points along the meridians is thought to unblock the qi. More than 800 acupuncture points have been identified, but only about 50 are commonly used. Acupuncture is usually used as a treatment together with herbal medicines. 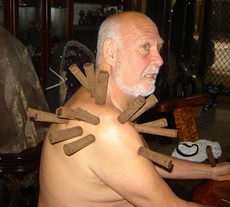 Moxibustion refers to the practice of burning a moxa wick over the patient’s skin at vital points. Moxa is a word derived from Japanese and means “burning herbs.” The moxa wick is most commonly made from Artemisia vulgaris, or Chinese wormwood, but other herbs can also be used. Moxibustion is thought to send heat and nourishing qi into the body. It is used to treat a number of different illnesses, including nosebleeds, pulled muscles, mumps, arthritis, and vaginal bleeding. Diet is regarded as the first line of treatment in Chinese medicine; acupuncture and herbal treatments are used only after changes in diet fail to cure the problem. Chinese medicine uses foods to keep the body in internal harmony and in a state of balance with the external environment. In giving dietary advice, the Chinese physician takes into account the weather, the season, the geography of the area, and the patient’s specific imbalances (including emotional upsets) in order to select foods that will counteract excesses or supply deficient elements. Basic preventive dietary care, for example, would recommend eating yin foods in the summer, which is a yang season. In the winter, by contrast, yang foods should be eaten to counteract the yin temperatures. In the case of illness, yin symptom patterns (fatigue, pale complexion, weak voice) would be treated with yang foods, while yang symptoms (flushed face, loud voice, restlessness) would be treated by yin foods. Chinese medicine also uses food as therapy in combination with exercise and herbal preparations. One aspect of a balanced diet is maintaining a proper balance of rest and activity as well as selecting the right foods for the time of year and other circumstances. If a person does not get enough exercise, the body cannot transform food into qi and Vital Essence. If they are hyperactive, the body consumes too much of its own substance. With respect to herbal preparations, the Chinese used tonics taken as part of a meal before they began to use them as medicines. Herbs are used in Chinese cooking to give the food specific medicinal qualities as well as to flavor it. For example, ginger might be added to a fish dish to counteract fever. Food and medical treatment are closely interrelated in traditional Chinese medicine. A classical Chinese meal seeks to balance not only flavors, aromas, textures, and colors in the different courses that are served, but also the energies provided for the body by the various ingredients. Chinese herbal treatment differs from Western herbalism in several respects. In Chinese practice, several different herbs may be used, according to each plant’s effect on the individual’s qi and the Five Elements. There are many formulas used within traditional Chinese medicine to treat certain common imbalance patterns. These formulas can be modified to fit specific individuals more closely. In 2002, a study in Texas showed that a traditional Chinese antirheumatic herb extract helped patients with rheumatoid arthritis by improving symptoms such as morning stiffness and tender, swollen joints. Side effects of decreased appetite and nausea were tolerable for those the herb helped. The researchers planned to move on to a more scientifically controlled clinical trial phase to further test the herb’s effectiveness. Another scientific study that year reported new benefits for applying soy proteins, an ancient Chinese practice, to the skin. Scientists worked on a new preparation that showed benefits in reducing age spots and ultraviolet ray damage, and smoothing and moisturizing the skin, among other benefits. A traditional Chinese herbal formula typically contains four classes of ingredients, arranged in a hierarchical order: a chief (the principal ingredient, chosen for the patient’s specific illness); a deputy (to reinforce the chief’s action or treat a coexisting condition); an assistant (to counteract side effects of the first two ingredients); and an envoy (to harmonize all the other ingredients and convey them to the parts of the body that they are to treat). Massage is recommended in traditional Chinese medicine to unblock the patient’s meridians, stimulate the circulation of blood and qi, loosen stiff joints and muscles, and strengthen the immune system. It may be done to relieve symptoms without the need for complex diagnosis. Chinese massage is commonly used to treat back strain, pulled muscles, tendinitis, sciatica, rheumatism, arthritis, sprains, and similar ailments. In Tui na massage, the practitioner presses and kneads various qi points on the patient’s body. The patient does not need to undress but wears thin cotton clothes. He or she sits on a chair or lies on a massage couch while the practitioner presses on or manipulates the soft tissues of the body. Tui na means “push and grasp” in Chinese. It is not meant to be relaxing or pampering but is serious treatment for sports injuries and chronic pain in the joints and muscles. Tui na is used to treat the members of Chinese Olympic teams. Another form of therapeutic exercise is t’ai chi, in which the person moves through a series of 30–64 movements that require a relaxed body and correct rhythmic breathing. Many Chinese practice t’ai chi as a form of preventive medicine. Preparations for treatment in traditional Chinese medicine are similar to preparing for a first-time visit to a Western physician. The patient will be asked to give a complete and detailed medical history. The practitioner may touch the patient’s acupuncture meridians to evaluate them for soreness or tightness. The major difference that the patient will notice is the much greater attention given in Chinese medicine to the tongue and the pulse. The Chinese practitioner will evaluate the patient’s tongue for form, color, and the color and texture of the tongue fur. In taking the pulse, the Chinese therapist feels three pressure points along each wrist, first with light pressure and then with heavy pressure, for a total of 12 different pulses on both wrists. Each pulse is thought to indicate the condition of one of the 12 vital organs. Side effects with traditional Chinese medicine are usually minor. With herbal treatments, there should be no side effects if the patient has been given the correct formula and is taking it in the prescribed manner. Some people feel a little sore or stiff the day after receiving Tuina massage, but the soreness does not last and usually clears up with repeated treatments. Side effects from acupuncture or from therapeutic exercise under the guidance of a competent teacher are unusual. However, care should be taken in using herbal preparations and possible side effects or toxins within any preparations, as well as interactions with other drugs. Patients should consult with qualified practitioners. At present, there is renewed interest in the West in traditional Chinese medicine. Of the 700 herbal remedies used by traditional Chinese practitioners, over 100 have been tested and found effective by the standards of Western science. Several United States agencies, including the National Institutes of Health, the Office of Alternative Medicine, and the Food and Drug Administration (FDA) are currently investigating Chinese herbal medicine as well as acupuncture and Tui na massage. In general, however, Western studies of Chinese medicine focus on the effects of traditional treatments and the reasons for those effects, thus attempting to fit traditional Chinese medicine within the Western framework of precise physical measurements and scientific hypotheses. 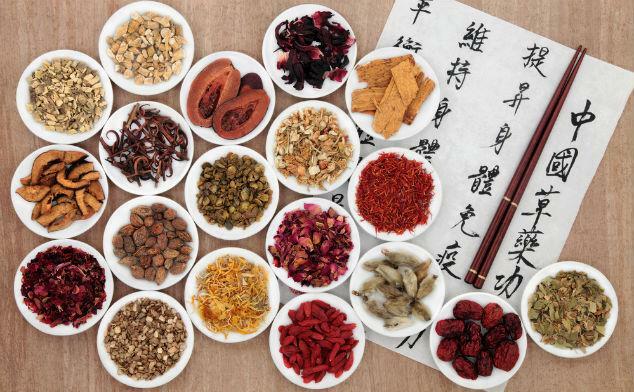 As use of traditional Chinese medicine has increased steadily in the West, many allopathic physicians have needed to understand the intricacies of the practice and to know how to deal with adverse reactions to herbal remedies. 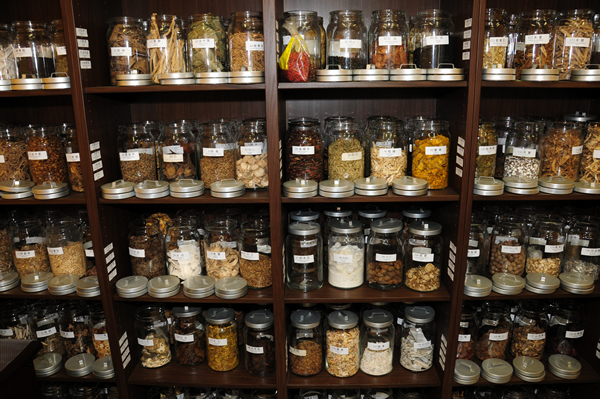 In 2002, a project was undertaken to develop a Chinese herbal medicine toxicology database to share information about English and Chinese studies on Chinese herbal medicines. The goal of the project was to help doctors in Western hospitals better manage poisonings or adverse reactions to Chinese medicines.